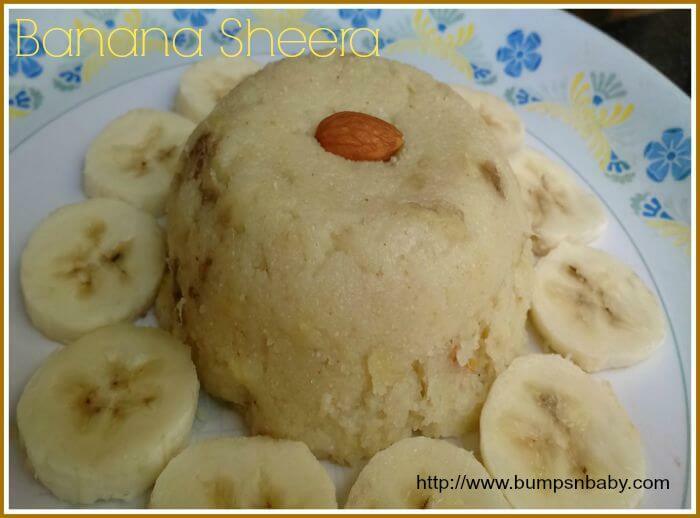 Today I bring to you the banana sheera recipe for babies and kids. 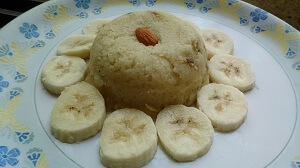 It is also known as ‘banana suji halwa’, banana semolina porridge or banana kesari baath. My maid introduced ‘rava sheera’ to me, when she made it for my daughter. 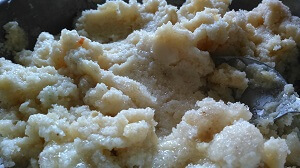 Rava or sooji roasted in ghee, cooked with milk/water, finished up with a pinch of salt and sugar – that’s how my maid prepared her version of suji sheera for Anshika. In Mumbai I have seen sheera being served as prasad during poojas like Ganesh pooja, Devi pooja and Satyanayan pooja. For a Keralite like me, sheera is similar to kesari or kesari baath, a deep orange colored sweet dish served for auspicious occasions. The beauty of sheera or kesari is that you can add a variety of flavors to it – like pineapple sheera, badam sheera etc. Rava sheera or banana semolina pudding is one of the foods given to baby once he/she turns 7 months. The potassium, magnesium and phosphorous contents in rava help in the healthy functioning of heart, kidneys, nerves and muscles. It also helps to boost immunity due to the zinc present in it. When I made this sheera, I loved the aroma of ghee roasted rava which filled my kitchen. The addition of banana gives it a unique flavor too. If you have introduced bananas and rava separately to your baby and he/she is fine with it, then you can give this banana sheera. This banana sheera recipe is ideal for babies of 7 months and above if the whole milk is replaced by water, sugar with jaggery omitting the dry fruits. As bananas gel completely with rava, ghee and sugar, this dish is a great way to give bananas to kids. You might be surprised if I say that my daughter who hates banana, had this banana sheera without any qualms. You can also read the 13 kerala banana recipes for babies, toddlers and kids. Roast rava for 10 minutes. Make sure it doesn’t turn brown. The process can be done in advance and the cooled roasted rava can be kept in airtight container until usage. Heat a kadai with ghee. Add the roasted rava and let it mix well with the ghee. Keep stirring till the ghee roasted aroma emanates. Keep the flame on low and add the bananas. Mix well. Add the hot milk and dry fruits while stirring continuously. The rava has to be cooked in the milk and it should not be lumpy. 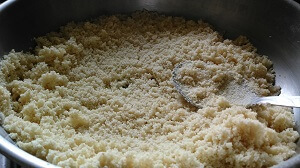 Once the milk is absorbed and rava is fluffed up a bit, add sugar or jaggery. Keep stirring until the mixture gets a halwa consistency. You can add a little bit more ghee and cook till the mixture leaves the sides of the kadai. Garnish with dry fruits, kesar or banana slices. Banana sheera can be served warm or chilled depending upon the age of your child. Anshika loved both the chilled and warm versions. Banana sheera stays fresh for 2 days if kept in an airtight container inside the fridge. However, it’s best to serve warm. Heat a kadai with ghee and roast rava for 3 to 4 minutes. Add in bananas and mix well. Add milk or water and dry fruits stirring continuously until the rava absorbs all the milk. Once the rava is cooked and lump free, add sugar or jaggery powder. Stir well till the mixture leaves sides of the pan. Serve warm. Do try at home this banana sheera recipe for babies and kids. You can also try this thari kanji or rava porridge recipe for babies. Is there any other way you prepare banana sheera or semolina banana porridge? Do share with me in comments. 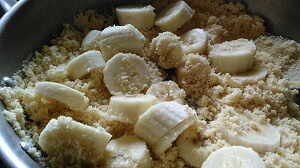 And here how I do sugi banana sheera for my 1 and 3 months old boy…. Ratna, its completely fine if he doesn’t like spicy food. You can start by adding a slit green chilly in his dal and remove it before serving him. Yes add ghee to the rice , its really good. Replace sugar with purees like chikoo, banana,apple and pear. He will start having spicy foods gradually, dont worry about that 🙂 Hope it helps.